Alive and Young: Vatican: The Board Game. From Cardinal to Pope. Now you too can be Pope! 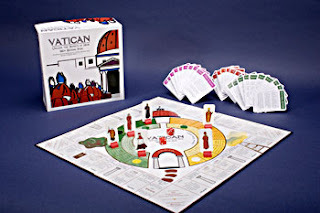 Thank you for taking note of Vatican the board game in your blog. I have always felt that one of the most unique things about the game from a Catholic perspective is that it is broadly supportive of the principle of hierarchy. "Vatican" demonstrates how the "papabile" are trained for the highest office in the Church by a rigorous process of gaining experience through progressively more responsible office holding as they advance in their careers. This process is responsible for the high quality of the popes of the 20th and 21st centuries. You and your readers might also be interested in looking at "Explore Church History" at www.explorechurchhistory.com our free site which contains a large and constantly expanding database on all aspects of church history. One of the ways "Explore" evolves is through reader suggestions for additional entries and content.One of my goals is to enrich "Explore" with a whole series of interactive modules that will lead visitors into deeper engagement with the historical content on the site.